Over the years a number of popular writings have been published about Bosworth and his healing ministry. However, only a few sources have provided critical research on his life and his teachings. This section presents detailed critical research on Bosworth’s entire life history. F.F. 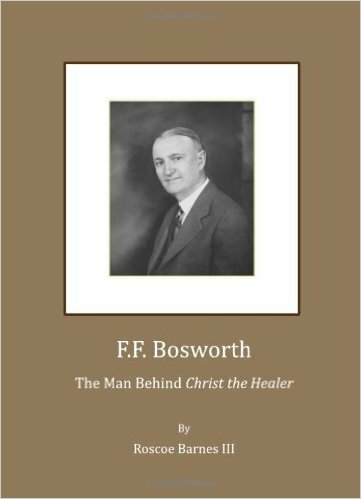 Bosworth: The Man Behind "Christ the Healer." Cambridge: Cambridge Scholars Publishing, 2009. Available here. "A Response" by Kimberly Ervin Alexander, Ph.D., presented at the 36th Annual Meeting of the Society for Pentecostal Studies in Cleveland, Tenn. Available here. Dr. Alexander is ​Associate Professor of the History of Christianity at Regent University. She is the author of Pentecostal Healing: Models of Theology and Practice(Blandford Forum, Dorset: Deo, 2006). Visit her faculty page here. "Plagiarism or Just Eerily Similar: A Brief Look at the Writings of F.F. Bosworth and Kenneth E. Hagin. "Available here. ​Other Writings on F.F. Bosworth: A Partial Bibliography. Available here. "The End of Something Short: Hemingway’s Use of Repetition as a Closing Device in Five Short Stories." Presented at the 17th Biennial International Hemingway Society Conference at Dominican University. July 21, 2016. See abstract here and paper here. This list of reviews focuses on Christian writings that present teachings, theology, doctrine and practical instructions for various aspects of the Christian life. The featured titles are both popular and academic. Book Review (unpublished): The Great Azusa Street Revival: The Life and Sermons of William Seymour. Available here. Book Review: Getting the Gospel Wrong: The Evangelical Crisis No One is Talking About. Available here. Book Review: The Gospel and Personal Evangelism. Available here. ​Book Review: ON EARTH AS IT IS IN ADVERTISING: Moving From Commercial Hype to Gospel Hope. Available here. Book Review: Descending Like a Dove: The Truth About the Holy Spirit. Available here. Book Review: Experiencing Healing Prayer: How God Turns Our Hurts into Wholeness. Available here. Book Review: Divine Healing: A Biblical Solution to Sound Health. Available here.